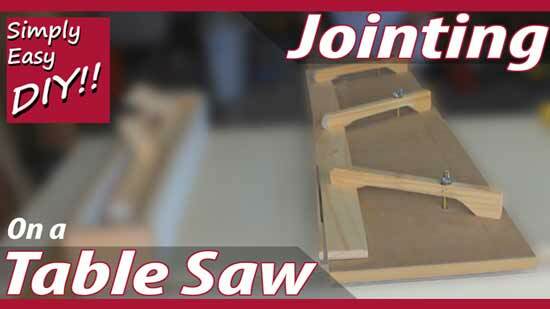 Jointing boards without a jointer can be simple and easy. Here's what I do in my shop. A while back I built this DIY jointing jig. This can also be used as a tapering jig as well but I’m not going to go into that aspect here in this video. The most common comment that I get on this are people saying they don’t see how you make a parallel cut with the other side of the board. Because my thought was why would you want to do that. That’s what a rip fence is for. Traditionally if you had a jointer you wouldn’t take a board and joint one edge on your jointer and then flip it over and joint the second edge on your jointer as well. What you would do is after you jointed your first edge you would then take it over to your table saw, set up your rip fence and the side that you jointed on your jointer is then ran against the fence in order to joint the second edge of your board. So my initial thought with those comments was, "Why would you want to do that?" So after thinking about this for a bit I came to the conclusion that there is this thought process by many people about how they are suppose to go about jointing boards and I don’t want to say incorrect, because how you go about doing something is your business. It is not for you, me or anyone else to say that it’s incorrect, but I would say that it’s not how I would go about doing it. Therefore because our thought processes maybe differ on how you go about jointing boards, to those people this jig doesn’t make a lot of sense. So I’m going to go over the technique that I use to joint boards in my shop. I’m going to use the tools that I have at my disposal and one of those tools is a thickness planer. I understand that a lot of people may not have one because let’s face it, these things can run some money. A thickness planer is one of those tools that I do and don’t recommend. It depends on you and what you do and how often you do it. If all you do is 2 or 3 projects a year. It’s probably not worth it to drop the cash needed to bring one of these into your shop. I do the math like this. By having this in my shop I’m going to use certain materials that have been either scrap or reclaimed lumber that I wouldn’t otherwise use. So is the cost of that material greater than the cost of the machine over a certain period of time. This machine that I have came with a 3 yr warranty and cost me around 250 dollars. So will the material that I use because I have this in my shop be more than 250 dollars over that 3 year time span. If your only doing 2 or 3 projects a yr the answer is probably no. However, in my shop I’m pushing 50 plus projects a year though here so I probably make that back in about 6 months time. You however are going to have to take into account what it is that you do and how often you do it as I said earlier. Enough with that. Jointing boards. There are 2 faces to a board. Both here and here and then obviously two edges which would be here. I always start jointing boards with one of the faces. So here I have a board that has a pretty severe twist in it. What I’m going to do is pick a high spot on this board and fill in the gap so that it no longer rocks back and forth. In this instance some thin strips that I happen to pick up off the ground is going to work for me here. That gets me pretty close and then all I have to do is layer some blue tape and then that will take up the slack. And as you can see here after the first pass it just takes off the material at that high point. After a few passes you can see the effect here. Once I have a clean face on one side I can then take off the blue tape. Flip it over. And plane the other side . Now sometimes the faces of a board don’t need to be jointed. But assuming they do I always start with them first. Because that process that I just walked you through always leaves the edges of the boards out of square and what we need to do is square them back up. Now if you’re not jointing the faces of a board then this is where the process would begin for you. So I have my jointing jig and mine just happens to run in the miter slot. I did that for stability purposes only. I’m going to place the board on the jig and all I’m going to do is make sure that every part of the edge of this board is hanging over the edge of the jig. It’s the same principle as if you were using a jointer, it’s no different. You would run it through a jointer until every bit of the edge had been planned. Don’t worry about anything else, only that. Then, just run it through the table saw. Now I’m done with that jig. I don’t flip the board over and try to line up a parallel cut using the jig. It just simply not designed for that and there is no reason I would design it for that because that is what my rip fence is for. So then I will just set my rip fence at a distance that will cut at least a little bit off of every inch of the other side of the board. Run it through per the norm. There I have a jointed board that is both straight and true. Simple and easy style. Don’t forget to check me out on Facebook and Pinterest. You can stay up to date on all the latest news. Simply easy diy dot com for all sorts of projects both great and small to help you on your DIY journey.